I love a glut. When seasonal produce is plentiful, I experiment. For lots of confluent environmental reasons, this year’s organic farm strawberry harvest is as sensational as it is plentiful. I am making the most of it at four quarts or more a week. 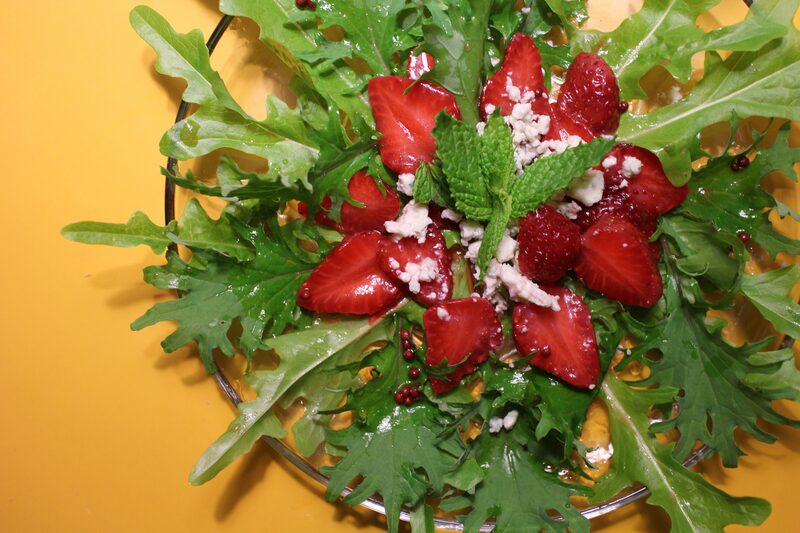 I experimented with pickled strawberries last year, when yields were stingy and crops stayed green and hard in the fields. Those were pickled green strawberries, which had a kind of momentary appeal in the absence of anything rosy or red, but in the end weren’t satisfying. I should try them again when even the green ones are plump, since last year’s green dwarves had more seeds than flesh. Not so this time. But I moved on to red berries, given the bounty. I make pickled cherries every year, and sometimes, pickled grapes, so why not pickled strawberries? The nudge to do this came from a Kickstarter project called Short Stack and the third volume in the series, Strawberries by Susan Spungen. It’s a limited edition of thoughtfully designed, small-format, handmade booklets, each on a single topic and each written by an interesting and known food person. 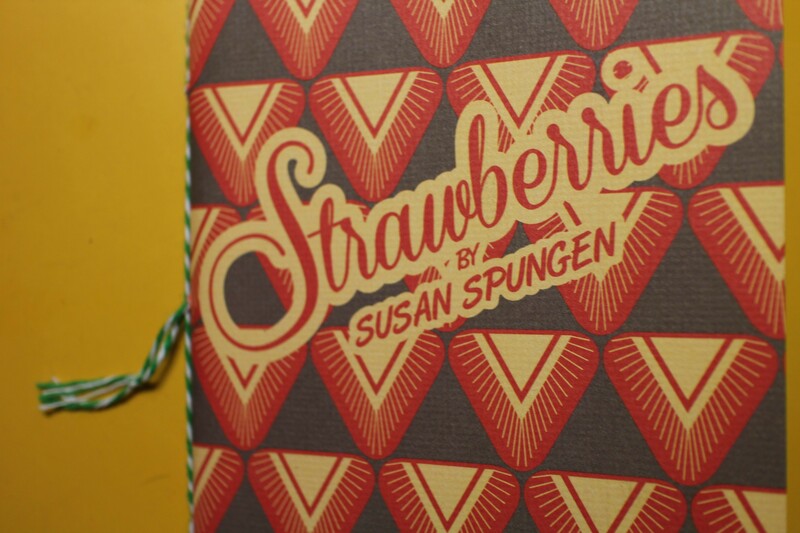 (Susan Spungen was involved in the Julie and Julia film and was the founding food editor at Martha Stewart Living.) This project appealed to me because – despite the convenience of the digital age – there’s nothing like well worn volumes to bring back memories of the meals you made from them. I annotate my cookbooks, so I might come across a note of when I made some dish or another, who was there, and so on. These books become friends and in some ways, memoirs (or memory palaces, another topic altogether). Though I should sometime drill down on the Short Stack project, and consider whether it would ever be well worn, right now I was focused on the strawberries. Q&A: Why pickle strawberries? They’re fleeting. Extend the season, even by weeks. Enhance the taste profile. Q&A: What are the pickling ingredients? Equal parts of water and a mild vinegar like rice vinegar or champagne vinegar, a little sugar for sweet pickle and less for savory, spices like vanilla for sweet or coriander for savory, mint, black pepper. Q&A: What do you do with them? Well, it depends on whether you’ve prepared them sweet or savory. If sweet, serve with desserts like custard or ice cream. If savory, use them in salad, including the juice as part of the dressing. The leftover liquid makes a refreshing drink with seltzer water, often referred to as a shrub. Q&A: What’s the timeframe? 15 minutes to prepare, 1 day to cure, 3-4 weeks stored in the fridge. Clean the jar thoroughly and the trimmed strawberries neatly without crushing them. In a small pan over medium heat, dissolve the sugar and salt in vinegar and water, stirring. Set aside to cool. 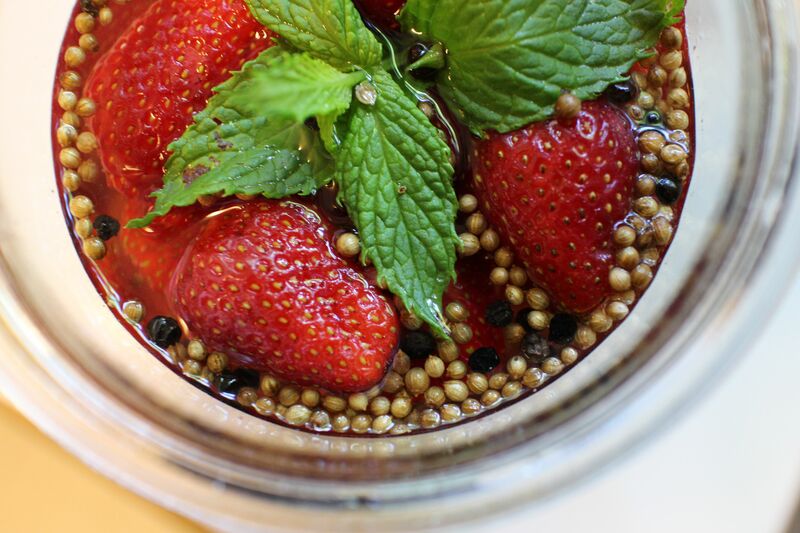 Add the peppercorns, coriander seed and mint to the strawberries and pour the liquid over the top. Seal and refrigerate for a day before using. They keep 2-4 weeks. Sweet Pickled Strawberries. Increase the sugar to 4 tbsp and substitute the seeds of 1/2 vanilla bean for the coriander. I will be trying this and thank you thank you thank you for a pickled fruit recipe that doesn’t have cinnamon, clove, allspice or anise. While warm spices are delicious it seems like there is an overabundance of recipes with those spices.